Yangon International Airport (sometimes call Yangon Mingaladon Airport) is the primary entry point for most travellers from abroad. It has two terminals, international and domestic. There is a shuttle bus that runs between the terminals with a 20 minute frequency and both terminals have Visa- and Mastercard-ready ATMs and pre-pay mobile SIM cards sales counters. We have help desks at both terminals under the banner of our partner company Flymya.com, where we can provide travel information and book domestic transport, activities, tours, and accomodation. Domestic schedules can be found in the tables below, and you can book these flights online on this website (click on button below the tables). 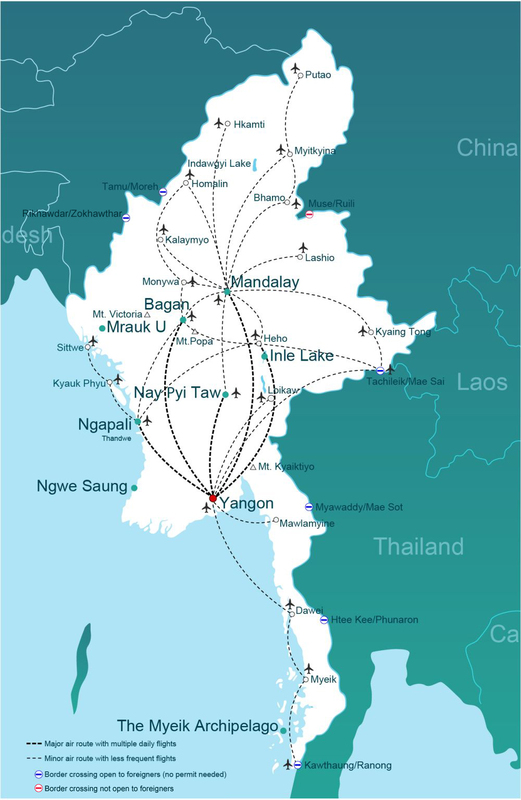 A list of international direct flights to Yangon can be found here and details of how to get to Myanmar can be found here. A taxi from the airport to downtown Yangon should cost no more than K8000 – haggling will sometimes be necessary. There are red and white air-conditioned airport shuttle buses that run from the International Terminal to Yangon Central Railway Station and Sule Pagoda in the heart of downtown, with 16 stops along the way. The service operates from 4am to 10pm and a single fare is K500. A taxi to Aung Mingalar Bus Station takes approximately 30 minutes and costs K3000. To find out more about flights, go to getting around Myanmar by air. Both of Yangon’s main bus terminals are situated a long way from the centre of town – sometimes taking an hour and a half by taxi if the traffic is bad (cost is around K8000). Public transport options are difficult for foreigners as local buses are very slow and they are in Burmese language only. Some bus companies pick up and drop-off closer into town, just north of Inya Lake (you will be informed when booking your ticket if this is the case). For more information on Yangon’s bus terminals, scroll down below the bus schedules. Buses from most destinations around Myanmar arrive at Aung Mingalar Bus Terminal (sometimes known as Highway Bus Station); a taxi to downtown Yangon costs K8000 and takes one hour to an hour and half, depending on traffic. A taxi from Yangon International Airport takes approximately 30 minutes and costs K3000. There are ATM facilities at the main bus arrivals point. Buses from Chaung Tha beach, Ngwe Saung beach, Pathein, and other destinations in the Irrawaddy Delta region arrive at Hlaing Thar Yar Bus Terminal (also know as Dagon Ayar), across the Bayintnaung Bridge (K8000 taxi from downtown, one hour to an hour and half journey time). Buses from Bago arrive at Saw Bwar Gyi Gone bus station, near the airport (there are buses every day throughout the day from Bago, tickets cost K2000). There is no English Language signage at Yangon’s bus terminals, and the two main terminals are very large – it is advisable to show your ticket to your taxi driver, so you are taken to the correct place when you get there. For details of bus journeys to and from different places around the country, go to destinations. Bus tickets that cannot be bought online here can be bought at the bus terminals; or from bus company offices at Aung San Stadium (just north of downtown, by Yangon Central Railway Station). Yangon Central railway station is a few minutes’ walk north of the central downtown area, between Alan Pya Pagoda Road and Upper Pansodan Street. Inside the building you will find a digital display, which shows train numbers, times and destinations in English and Burmese. As well as Mandalay and Bagan, direct trains connect Yangon with many destinations around the country, including Nay Pyi Taw, Pyay, Mount Kyaiktiyo (the Golden Rock), Mawlamyine and further south. Further connections are possible, although if this is necessary it will often be simpler to take the bus. Tickets from Yangon to certain places can be bought online here – for further details, including pricing and timetables, check out individual destination pages. Alternatively, you can go direct to the Myanmar Railways booking office on Bogyoke Aung San Road, opposite the Sakura Tower (the tallest building in downtown Yangon); this is on the opposite (south) side of the railway tracks from the main station building. If you are buying a ticket on your day of travel, you should do this in the railway station itself. You can get to various points in the Irrawaddy Delta by boat, including Pathein; boats arrive and leave from different jetties along the downtown river front depending on your destination. Taking the boat makes for an interesting journey, but it is much slower than taking the bus. To find out more about boat travel, go to getting around Myanmar by boat.